The Popular Culture/American Culture Association is an international, academic organization whose different areas of research and interest cover alphabetically from Academic and Collegiate Culture through World’s Fairs and Expositions, with a lot in between. Popular Culture includes discovering the social impact of media, media support industries, live exhibits and performances. Of special interest to ASDAH members is the PCA/ACA Fat Studies Area. That area hosted nine different sessions at the 44th annual national conference in Chicago, April 16-19, 2014, where about 30 other scholars and I from across the globe presented on Fat Stigma and Activism, Fitness and Diet Cultures, Fat and Visual Media, among other topics. Here’s a sampling of my interpretation from some of the Fat Studies sessions. Three Fat Studies scholars and a HAES® oriented business man critiqued Dr. Katariina Kyrölä’s new book The Weight of Images: Affect, Body Image and Fat in the Media. The academic theory-based text explores how the media establish norms and have a corporeal effect on the viewer. As a recovering bulimic, the author also analyzed her own viewing of the images and her struggle working through the images that portrayed fat in a hateful way. Dr. Kyrölä discussed how fat women are alternately desexualized and hypersexualized as was the African American female lead in Eddy Murphy’s fat woman hateful film, Norbit. Doctoral student Amanda Gilliam noted that fatness is also a racial problem and that thinness is a way to access social power, especially for people of color. Jay Solomon, co-founder of the HAES modeled retail business More of Me to Love or MOMTL, discussed size-friendly policies for health in the workplace. Acknowledging that higher weight people are hired less often, paid and promoted less when they do get hired, he talked about his success in instituting weight neutral guidelines such as no diet talk in the work place because it creates a hostile environment for those whose goal is intuitive eating. He also has voluntary walking meetings and encourages breaks so that employees can get up and move. After some analysis, his business established a separate, pleasant place for employees to eat, to provide an alternative to the non-intuitive eating unconsciously at our desks habit. Michaela A. Nowell led what was for me a fascinating session on teaching Fat Studies. She discussed three ways one might approach teaching Fat Studies: 1. As healthcentric and showing how fat is disconnected from health, noting that the class isn’t “promoting obesity.” This approach causes some challenges, especially for higher weight teachers, who aren’t medical doctors because students, so immersed in our fataphobic culture, simply may not believe the teacher. 2. Fat Studies as a human rights issue, noting that if only those who meet with certain so-called health standards are allowed to have human rights, anyone who loses those “health” characteristics will be denied the human rights they used to “be entitled to.” Another disadvantage here is that the teacher can’t really explore the notion that health and fat are not mutually exclusive. 3. Her preferred approach is one that focuses on reframing health for the students by: A. Demonstrating health as a political, rather than just a personal issue. Even personal “choices” are influenced by weight stigma. B. Showing that fat is not inherently bad. C. Showing support that fat doesn’t equal unhealthy. D. Postulating that health shouldn’t be moralized. Shaming actually decreases the likelihood that people will be healthy. Fat Studies Area Chair Lesleigh Owens did a critical discourse analysis on, “Why do people hate fat folks so much?” We viewed a short documentary on fat as monster/horror. Owens hypothesized that one of the critical motivations regarding the disgust with fatness is the anger in the notion that those who are able to become and/or stay thin through persistent, life-dominating suffering and sacrifice, may be enraged with fat people who the thin sacrificers perceive as not suffering as much as they do. She said that fat bodies “gone wild” so to speak, are perceived in the horror flick sense, vs. as the otherwise thin co-eds baring their breasts’ bawdiness. Under that rage may also be the fear and real terror that should the thin sacrificers let up at all with their suffering, or be unable to continue, all their pain will be for naught and they shall be one of the walking-fat-might-as-well-be/about-to-be-dead zombies. I presented research on the higher weight and arithmetically difficult multi-layered stigmas African American women face and attempted to debunk the thin and white privileged myth that Black women (sometimes also included are Latinas) have an ethnic “protective factor” from weight stigma. I couched the presentation in a vocal interpretation of the first United States race protest song. It’s about female light skin color privilege in heterosexual coupling – “I’m So Black and Blue.” Despite my research “song and dance,” the thin, White woman presenting immediately after me, early in her presentation declared her unresearched opinion that, “Black culture celebrates fat women,” and motioned in my direction as she said it. I wanted to interrupt her by yelling something such as, “Did you not HEAR MY PRESENTATION?” Instead I politely wrote her a note offering to discuss whether she wanted to talk afterward about the many ways Black culture stigmatizes higher weight Black women. She didn’t. What was more disheartening was that in the question/answer session following the presentation, no one noted what the presenter had done. Also troubling was a presentation on weight loss dieting purportedly from a HAES perspective. There were also disturbing calls from newcomers and area members with thin children, who want the area to focus more on thin persons’ fear of fat, as well as their suffering of stigma for dating or otherwise supporting fat people. This seems to me to be unacknowledged thin and race privilege discomfort with not being the focus of attention. As one seasoned fat activist who was not at the conference responded when I was brainstorming with her about the problem, “It’s Fat Studies, not Fear of Fat – Studies.” In addition to all the good work going on in our communities, there remains much work to do around White and thin privilege in the HAES and Fat Activism Communities. I would like to see our community STOP saying there is no or less weight stigma for African American women. I would like when we mention cultures where there is less or no higher weight stigma, we make it clear what specific cultures we ARE talking about or at least that we’re NOT talking about African American or even Latina culture. Rather than leaving me hanging, feeling embattled and alone in what is for me debilitating, repetitive defense of my life experience and that of thousands of African American/Canadian/Latina women I’ve worked with on weight stigma, I would appreciate if those present who agree with me or believe me SAY SOMETHING TO THAT EFFECT PUBLICLY DURING the discussion. In addition, I would appreciate comfort and reinforcement afterwards publically AND privately. Let us continue and step up the intersectionality work in all earnest. Rev. 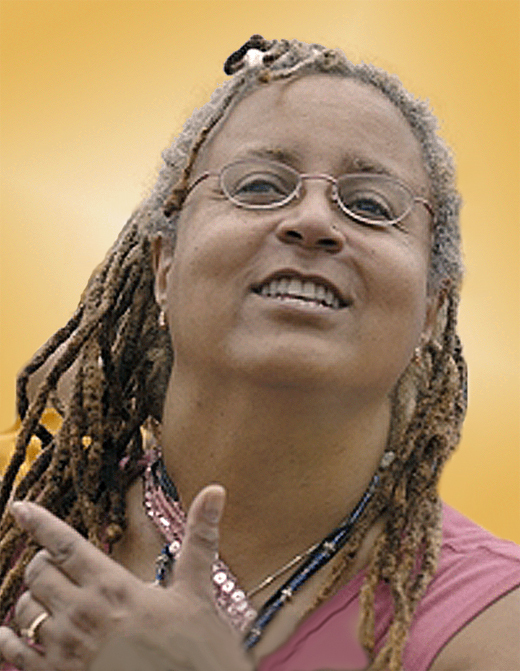 Dr. E-K. Daufin is an educator, social activist performance, fine artist and writer who earns a living as a professor of communication at Alabama State University in Montgomery, Alabama. Her research and writing specialty is exploring weight stigma in the media and its effects. Dr. Daufin is a HAES® expert, Spoken Word poet, Reiki Master, belly dancer, EFT Practitioner and consultant. You can read more about her workshops on her webpage.